Unique & Special Father's Day Gift for Dad Online. Best Gift Ideas. Give Your Dad a Unique Gift on Father's Day! 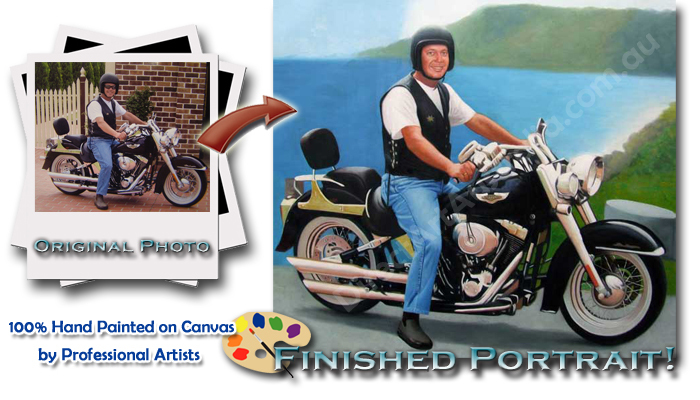 Something that your father, grandfather, and even your friend's dad will love...a custom painting from a photo! Your dad's a legend! You know it, your siblings know it, even your mom thinks he's the best thing that's ever happened since sliced bread. And since Father's Day is fast approaching, you want to give him a gift that will truly make him smile. But one of the biggest obstacles that seem to make gift buying for dads so difficult is the idea that if you want a man to appreciate your gift, get him something he can use. This means something he can play with, something he can use at work, in his car, etc. Well, it's time to be different and give him something unexpected like a painting or a portrait. We at Direct Art Australia want to make everyone's Father's Day gift special and unique, which is why we offer a variety of paintings and portraits that will surely put a smile on his face the moment he wakes up to his big day as a father. Consider buying him a beautiful oil canvas painting for example. These paintings are made by experts and professionals who have a keen eye for detail. They go beyond what people would normally expect of a painting, which is why we stand out from the rest as an online seller of beautiful artwork. If a typical oil painting is too dull for an awesome dad like yours, you can get him a really unique portrait from photo for Father's Day! By just using any photo, you can turn it into a portrait that will become the best Father's Day gift for your dad. You can also make this as a Father's day present for your uncle, your grandfather, your best friend's dad, and even your boss. Portraits from photo are some of the most popular and yet unique gifts to give to him so don't hesitate to pick a good picture out of the ol' photo albums and turning it into a magnificent portrait on canvas. A Father's Day gift should be something he will cherish throughout the rest of his life. It should be something he will admire, treasure, and remember you by most of all. Try giving him a famous reproduction of an artwork by his favorite painter. If he likes Caravaggio, get him a reproduction of a popular Caravaggio painting. If he's a fan of Matisse, a reproduction of a painting by him will definitely make a good choice. Whatever may be your choice of a Father's Day gift for him, you will find all of your painting and artwork needs here at Direct Art Australia. We have a wide selection of pieces that will surely be a great present for your dad on Father's Day so just browse through our galleries for the painting of your choice. We ship for free to all locations in Australia, including Melbourne, Sydney, Brisbane, Perth, and Adelaide.